From my 10 revues at Chicago's Second City performing with the likes of Steve Carell, Stephen Colbert, Amy Sedaris, and Rachel Dratch, to the 10 years I spent as Artistic Director of The Second City Hollywood, to the countless worldwide workshops and performances I've engaged in, to my TEDx Talk, “Life: The Product is the Process,” I've developed a simple approach to improvising: Your present awareness is the only thing you need to create compelling, smart, truthful, and surprising scenes. Period. No games, no preconceived premises, no ideas, no ego. All that matters is now. The actor’s level of improvisation experience doesn’t matter, for all you'll need to bring to my workshop is your present presence. All you’ll leave with is your joy and excitement and confidence. And after all, what more do you need? As long as you've internet access I'm ready and able to coach you alone, you and a partner, you and a group, you and a marching band, etc. Through the magic of Skype, Zoom, FaceTime or other video chat software I'll work with you to become connected and aware, and to help find your strengths and your voice. Each individual two-hour coaching session is recorded and delivered to your inbox so you can review the time we've had and work on your new skill sets. Because sometimes you just need another eye. Because sometimes you need to make sure you’re on the right path. Because sometimes you’re ready to take it to the next level. Razowsky Remotely. You’re not alone. For information and rates, please email me. I teach over two dozen masterclasses designed to ground you, center you, and inspire you. Click on the picture for my Masterclass List. Mindfulness, awareness, kinesthetic response, truthfulness. Deeper scenes, surprising scene, scenes you’ve never done before. Connectedness! Seattle! 5/14-19, "Three Nights of Viewpoints" + "Improv is Acting"
“Finesse” Workshop and Performance in Orlando, 5/23-25. DC Improv Intensive is SOLD OUT! DC Improv 6/22-23 Workshop is SOLD OUT! I return to the wonderful Pan Theater, where Saturday and Sunday we’ll focus on connecting, exploring and making choices you’ve never before made. I’m a lucky dog...I get to play, and I’d love for you to come see a show or nine. I'll be adding more performances, so stay tuned! Today’s guest on ADD Comedy with Dave Razowsky is author Sam Wasson. Sam has written books on Bob Fosse, Paul Mazursky, Audrey Hepburn, Blake Edwards, and, the one that brought Sam to my attention, “Improv Nation, How We Made A Great American Art.” This is the only book I’ve ever read on how theatrical improvisation as we now know it came to be. It’s funny, smart, informative, heartbreaking, and alive. In other words, it’s just like a great improv scene. Our conversation bounds from improv inspiration, to what does it mean to play, to passion and creativity, to saying yes. It’s like an episode of Fresh Air, but with more cursing. Winner of the 2015 INNY Award for "Best Comedy Podcast," A.D.D. 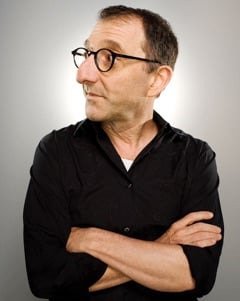 Comedy with Dave Razowsky has guests from the worlds of comedy, theatre, film, television, and literature on to discuss their journeys and life philosophies with Dave. Past podcast guests include Steve Carell, Stephen Colbert, Nia Vardalos, Mo Collins, Tim Meadows, Rachel Dratch, and a couple hundred more (and counting!). ADD Comedy isn't just about comedy, it's about the life that makes us laugh. Let your ears be the judges. Download 'em here! Have any thoughts on my podcast, drop me a line. Click on a photo to download in high resolution. Bob Kodzis's "Razowsky's Mind Map."